Happy Sunday! By the time this post goes live, I’ll be headed out of town to spend some time with one of my closest friends from college. I have the treat of seeing him a few times a year, since his folks are in New York, but it’s rare for us to have a five uninterrupted days together. I can’t wait. My hope was of course to have all of my ducks in a row before I left: school projects wrapped up neatly in time for spring break, work inbox mastered, etc. That is not how things have gone this week. In fact, they’ve gone the opposite way: I feel as though I can’t make a dent in all the stuff I’m behind on. And I found out a few days ago that a major school deadline that I thought would be squishy is in fact very, very firm. A year or two ago, that kind of discovery would have sent me tumbling into an anxiety black hole. That wasn’t my response this past week. I felt feelings, of course: frustration with myself for not being more on the ball. Guilt over having prioritized other things. Overwhelm. But the feelings were manageable, and I had the feeling they’d wash over me, giving me space and energy to focus on getting done what needs doing. It’s hard for me to be at peace with errors in judgment. Part of me wishes I’d been able to foresee this bind before I was in it, but another part of me is glad to be practicing self-forgiveness and staying calm in the face of something challenging and stressful. So, here’s to gentle self-compassion in the face of not getting it right all the time. Here’s to quieting guilt so that I can get things done. Here’s to me choosing against panic and being my most peaceful, trusting self. It’s not my norm, but this is the time to practice it. Wishing you all gentleness in the coming week. In a couple of days, I’ll be sharing a very beloved recipe from Power Plates and hosting a giveaway for three more free copies. For now, here are some of the recipes that I pinned and bookmarked this past week. 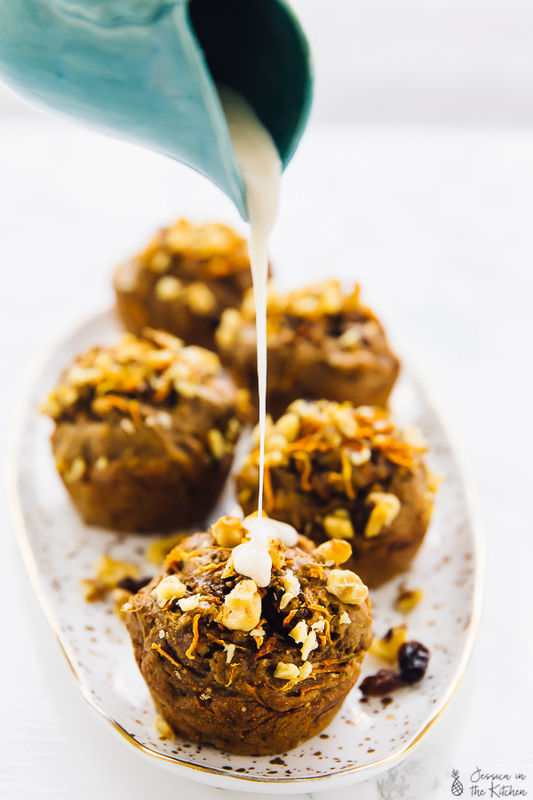 Wish I’d made a batch of Jessica’s awesome looking carrot cake muffins for my plane ride today! Yum. 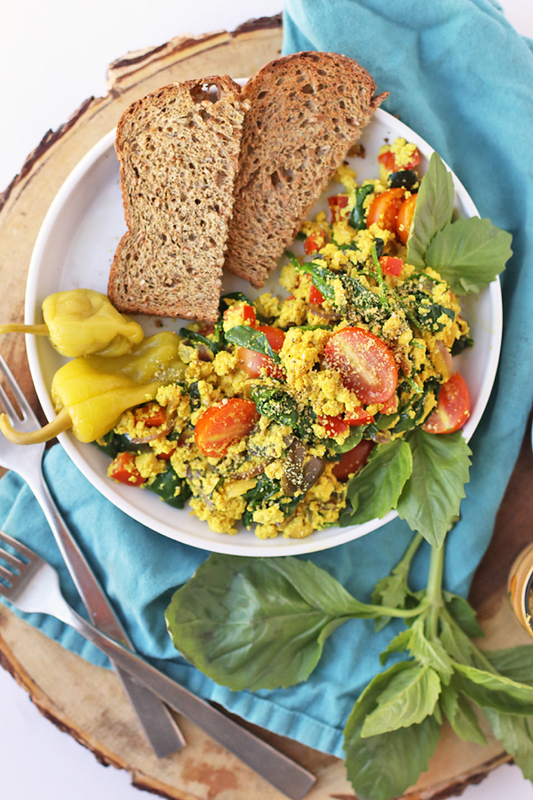 I can never get enough tofu scramble recipes, and I’m loving Sarah’s Greek-style version. Bet the olives add a wonderful saltiness and umami to the dish. My friend Cadry’s soy curl chili inspired this recipe, which is now on steady rotation in my home. 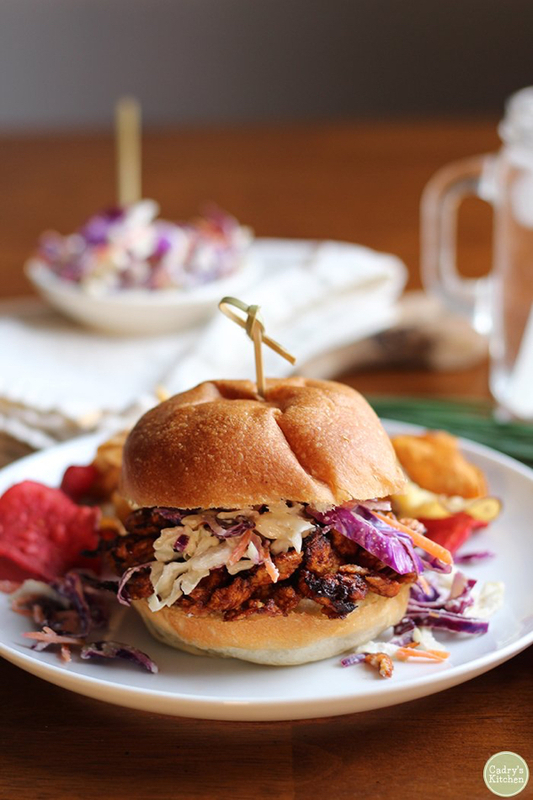 I’m dying to try her BBQ soy curl sandwich, which looks like the perfect comfort food lunch. 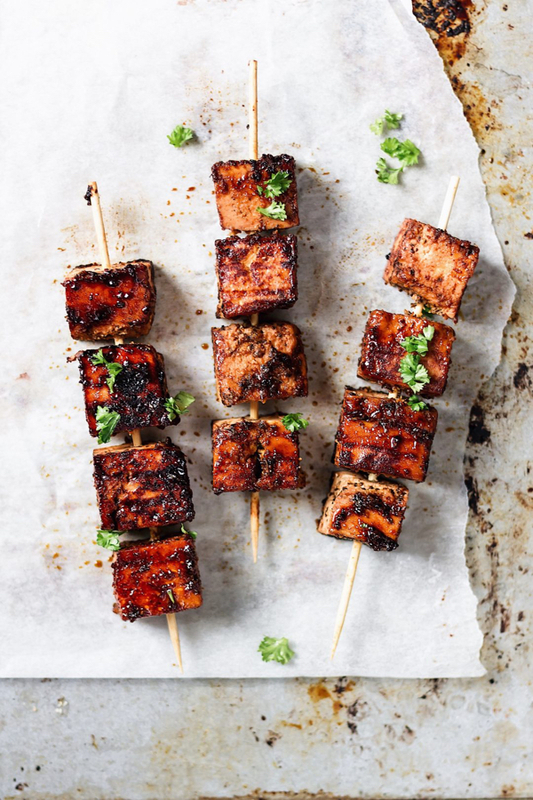 If soy curls aren’t your jam, maybe try these grilled cajun orange tofu kebab skewers? They look like a perfect party appetizer, and they’d be an easy protein to serve with weeknight dinners. It took me ages to figure out how great roasted cabbage is—so sweet and tender. 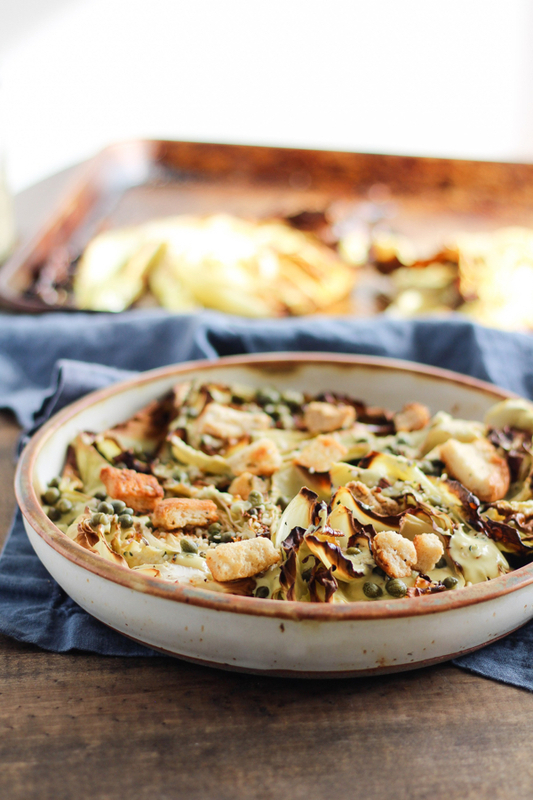 Nowadays cabbage wedges are one of my favorite vegetables to roast up in the winter months, so I’m super excited to try Stephanie’s roasted cabbage Caesar. 1. I’m often asked about food cravings and how best to handle them. Is it better to pause or to act? Are all cravings “valid” and worth heeding? My answer is that all cravings transmit information; even if they’re less indicative of true hunger than impulse or feeling, it’s still important to be alerted that the feelings and impulses are there. I invite my clients to thank their cravings for giving them clues about what’s going on with their bodies and spirits. Then I suggest that we spend some time mapping out practical strategies to better understand cravings and what they’re communicating. This article by Carrie Dennett offers some of the same guidance I often share, and it’s full of useful, self-compassionate cues. 2. A new review study suggests that children who have chronic illnesses that are treated with diet (including diabetes, cystic fibrosis, celiac disease, gastrointestinal disorders, and inflammatory bowel diseases) may be more susceptible to disordered eating. More research is needed to help explain why the link exists, so that practitioners can develop a set of best practices. For now, I’m glad that the information is out there, so that parents and physicians can practice sensitivity and awareness. 3. A few years ago, I meditated on the ways in which I sometimes fail to extend enough empathy and compassion to people with EDs, in spite of having been through recovery myself. This blog post has a different focus and message, but it brings up similar points about how easy it is to label and judge others who are struggling—or whom we assume are suffering—and how problematic both the assumptions and the judgments are. It’s complex, sensitive, and inspiring. 4. This is a long read, but it’s pretty fascinating: a look at how Finland launched an official, nationwide, and influential campaign to improve food and lifestyle choices—using everything from cozy fireside chats and reality TV shows to laws and incentives—in order to combat its epidemic of heart disease. I was especially intrigued by the role that women—in particular, a Finnish housewives organization known as the Marthas—played in transmitting the campaign’s key messages. 5. Finally, a Psychology Today article that relates to my musings this week. It explores the link between anxiety and procrastination, and boy, does it strike a chord. Having always prided myself on being a systematic and nearly unstoppable doer, it’s been very difficult to accept the tendency toward procrastination and lack of focus that anxiety has introduced into my life in the last few years. 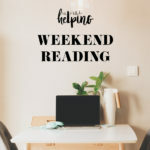 I was heartened to see that the article suggests self-compassion and abandoning negative self-talk as a means of letting go and moving forward. Enjoy the reads, and enjoy your Sunday. good luck making those deadlines, it sounds like you’re handling it well. I’ll definitely be curling up with some tea this afternoon and diving into that article about Finland – what a great idea! Thanks for this post, I can relate so well and enjoyed all the links. Have a great time with your friend! PS oh I really like the metaphor of “surfing the urge”–I do that a lot–and not just with food urges. Works great. I like having this image to go with it. Thanks so much for a chock-a-block post! I was kind of shocked by the blog post in which the author wrote about her need to still over-exercise. The part that was distressing was the idea that people working in a gym might be required (ethically) to approach someone who “appeared” to have an eating disorder. That idea is so fraught with wrongness that I wouldn’t even know how to untangle it. Also, I really like Carrie Dennett’s article about food cravings. Actually, I like her writing in general and have been sifting back through her blog posts. Her straight forward no nonsense approach is very refreshing. I sure hope you have a wonderful vacation and get all of the rest and fun that I am sure you deserve! Enjoy and thank you again. 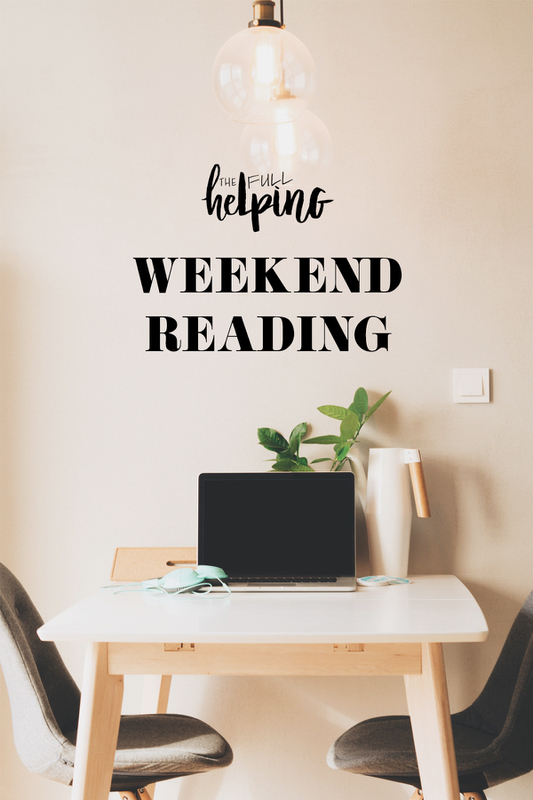 So many interesting, newsy reads this week! I’m going to enjoy clicking through them. Thank you for including my BBQ Soy Curls sandwich in your line-up!